The latest Wings Over New Zealand Show is available now, Episode 107 - THOR. 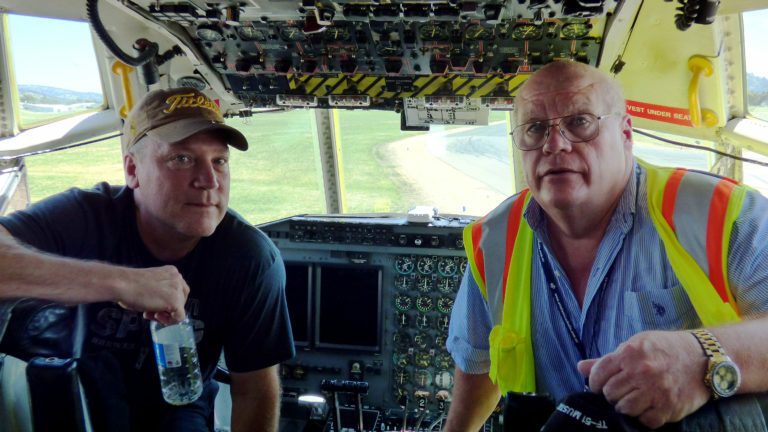 In this Wings Over Australia episode Dave Homewood and James Kightly chat with pilots Tim Martin and Rickey Rau, the pilots who fly Coulson Aviation’s amazing civil Lockheed L-100-30 Hercules ‘Thor’, N405LC. This Hercules is fitted with a state of the art fire retardant dropping system for attacking and extinguishing forest, bush and grass fires. ‘Thor’ and other North American-based Coulson Group aircraft, including another C-130, N130FF and actually named ‘Hercules’, have recently become familiar sights in Australian skies during the summer seasons as they are regularly contracted to spend the hot, dry months in Australia to fight the devastating bush fires as some of the biggest ‘Large Air Tanker’ (LAT) fire fighting aircraft down under. Dave and James were invited aboard by Tim and Rickey at Albury Airport in New South Wales and they agreed to an impromptu cockpit interview for the WOA / WONZ Show, which turned out to be really fascinating indeed. If you’ve ever wondered what it’s like to fly ‘LAT aerial attack’ on a bush- or wildfire in North America or Australia, here’s an insight. We find out what some of the challenges are flying in hot, flat Australia against the more mountainous territory ‘up over’, among many other fascinating aspects of a very different flying job. What I know about planes you could write on the back of a beer mat, but I'm looking for bigger beer mats!